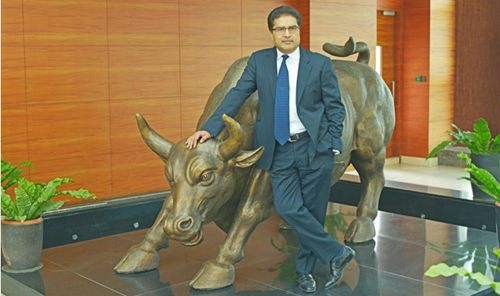 Raamdeo Agrawal, 59, Joint MD & co-founder, Motilal Oswal Financial Services Limited is a distinguished stock market investor who made a fortune of 1000 Cr starting from Zero. Raamdeo Agrawal is a value miner and brain behind popular wealth creation study report of Motilal Oswal . He does a lot of research when it comes to investment. Raamdeo Agrawal has got a real skill to identify future multi-bagger stocks. He is a self-made millionaire with asset worth 1000 Cr. You must be wondering that how he has done it. Well here is a success story of research expert and stock market analyst, Raamdeo Agrawal. Raamdeo Agrawal was from middle-class family. He was living in a village in a remote place where there were no electricity and proper roads. After completing regular education, Raamdeo Agrawal decided to study chartered accountancy in Mumbai. Raamdeo struggled a lot and took five years for the completion of chartered accountancy. During his study, he met Mr.Motilal Oswal. They teamed up and decided to enter in the stock market after completion of a study. They established “Motilal Oswal” sub-broking firm in 1987. From small sub-broking firm Motilal Oswal has become a big financial service provider today. Mr.Agrawal made a lot of money from the stock market as he is extremely good at selecting a stock. He is an analyst and value investor, his first multi-bagger stock pick was Hero Honda in 1997. Looking at upcoming business opportunity in motorcycle business he invested in Hero Honda stock. He was correct. Hero Honda has turn out to be first multi-bagger stocks for him. The next pick of Raamdeo was Infosys in 1998 where he could see an opportunity of a global Y2K boom. The journey continues with a stock pick of Airtel, where an opportunity was identified for mobile business. Mr. Raamdeo Agrawal is very generous when it comes to sharing knowledge. He shared five mantras of finding multi-bagger stocks to the investors. The Return on Equity (RoE) is an important parameter for the selection of stock. The RoE of the company should be minimum 20%. You should never look at a company with low RoE. In addition to that RoE of the company should be increasing. It should not be declining or stand still. RoE indicates that company is allocating proper funds and generating better returns. The second thing which is important for the stock selection is Terms of Trade. Check if the company is able to trade the product with cash on delivery or prepayment basis. The credit period indicates demand and strength of products. A company that offers long credit period indicates that demand for the product in the market is low as a company has to tempt the buyer to purchase the product by giving long credit period. On the other hand, a company with prepayment product indicates that buyer is ready to pay money upfront to purchase the product and competition is less. The next is to check cash flow of the company operating cash flow and free cash flow of company should be positive. Cash flow indicates profitability of the company. In order to know cash flow, you need to study cash flow statement of the company. If cash flow of the company is healthy go for it. Check the longevity of the business. How long business growth story will continue? Predicting longevity is a pure judgment based on experience. Can the stock be next McDonald where franchise demand will continue forever or it will be like kingfisher airlines disaster? Check if the company will be able to withstand the competition in the market or not. If a company is generating good revenue it is likely to face big competition, but there is an entry barrier or monopoly product it will rule the market. Do you think mantra given by Raamdeo Agrawal is useful? What is your method to identify multi-bagger stocks? Do share in the comment section.